Inside BET's "House Of BET" Experience During Super Bowl Weekend | RESPECT. 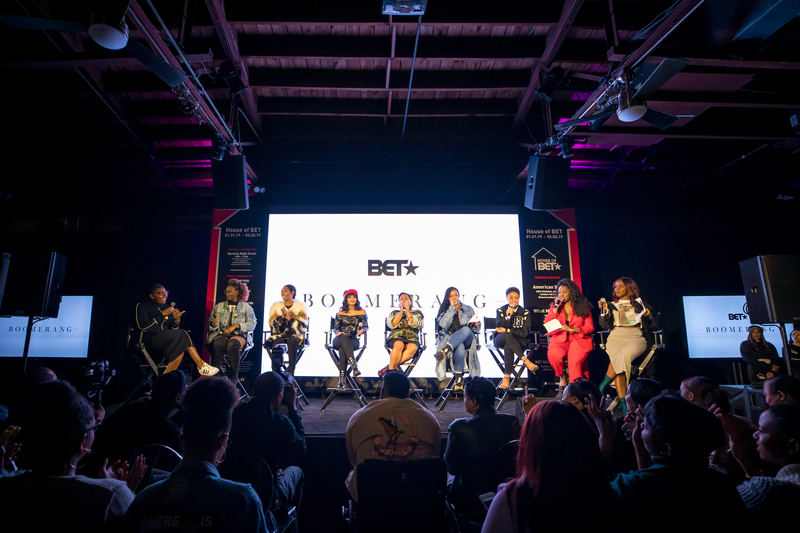 This Super Bowl weekend, BET took over Atlanta’s North Event Center with a three-day immersive experience that offered a variety of programming and sneak peeks of upcoming shows. The experience, which was produced and designed by Team Epiphany, included an installation inspired by AMERICAN SOUL, a new series that tells the story of Don Cornelius’ dance show Soul Train. The area featured a 1970s-theme dance floor and a giant disco ball. The experience also showcased this year’s BET MUSEUM OF MEME, the award-winning gallery that first launched in 2018 for the inaugural BET Social Awards. Comedic, social-media friendly exhibits included an “Is This Your King?” wall inspired by the film Black Panther, “Squat Bae” and a hilarious J.R. Smith and LeBron James art piece by illustrator David Park. Another exhibit turned a popular lyric from Drake’s song “In My Feelings,” which spawned a viral video challenge, into a game show. Guests were invited to answer the question, “Does Keke love you?” by picking a ping-pong ball that displayed emojis and other reactions. Also during the weekend, the HOUSE OF BET held several exclusive screenings & panel discussions of upcoming series/films like What Men Want, Boomerang (the TV version revival of the classic 80’s movie which starred Halle Berry and Eddie Murphy) and American Soul featuring the cast & crew of the show! Crowds were also treated to performances by hip-hop producer ZAYTOVEN and multi-platinum artist THE DREAM! Overall the weekend was a star-studded affair that invited celebrities, influencers, executives and ATL-natives to celebrate the culture and get a sneak peek at BET’s new programming for 2019!